Mechanical Binding Services - Steve's Bindery Service, Inc. Mechanical binding is an economical way to create bound documents that lay flat. It can also offer 360-degree rotation. 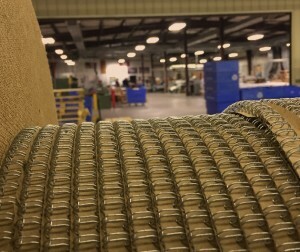 The process involves trimming, collating, punching, inserting tabs when needed, inserting a wire or plastic coil and closing. At Steve’s Bindery Service, Inc., we have a variety of colors available that will enhance black and white printed material or complement the document’s cover. We offer both Plastic Coil Binding and Wire-O Binding. Plastic Coil Binding not only offers a wide range of colors, it is also durable. It will hold its shape and bounce back if pressure is applied. It is a smoother product than Wire-O Binding, especially when in children’s hands. There are several options for pitch, which is the spacing between coil loops. A wider pitch is needed for larger coil diameter. Wire-O Binding uses a double-looped, coated metal. Bound documents and books have a competitive edge with this type of binding, and it adds a touch of classic elegance. This high-quality, attractive finish provides perfect page registration and because it has no “step-up,” it is great for crossover images. At Steve’s Bindery Service, Inc., our mechanical binding equipment consists of the Plastikoil Binder and the Wire-O Binder. Both are James Burn machines. The Plastikoil Binder has coil diameters of 6 mm to 30 mm, with multiple pitch options, including custom pitch. The Wire-O Binder offers operator convenience, high punching quality and efficiency. It is instantly adjustable and can bind up to 350 mm documents with wire sizes of up to 1 1/4” and to 500 mm wide documents with 9/16” wire. At Steve’s Bindery Service, Inc., our focus is on providing high-quality print finishing services at competitive prices. Our equipment is maintained to the strictest requirements, helping to minimize downtime and satisfy our customers’ schedules. When Steve says a product will be ready, it will be ready on time or earlier. This is what keeps our customers returning to us for their projects.